Tomatoes are a $2 billion crop in the United States, and we demand a lot from them. No matter where we live, we want fresh, delicious tomatoes to be available year-round. Large-scale producers ship tomatoes long distances, and that makes firmness and long-term storage top priorities for tomato breeders. Consumers, however, value garden-fresh taste. 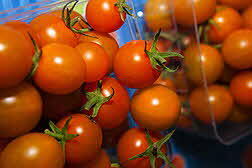 A common complaint is that tomatoes in supermarkets lack the flavor of locally grown varieties. To improve flavor, breeders need to know more about the varieties that hold the greatest potential for enhancing taste. U.S. consumers want tomatoes to be available year-round, and they want the garden-fresh taste. U.S. Department of Agriculture (USDA) molecular biologist Joanne Labate and plant geneticist Larry Robertson at Geneva, N.Y., worked with Dilip Panthee of North Carolina State University to explore tomato's diversity in a study designed to help breeders develop tastier tomatoes. What we refer to as “flavor” in a tomato is actually the interaction and ratios of sugars, organic acids, and volatile compounds derived from amino acids, lipids, and carotenoid precursors. Fructose and glucose are the major forms of sugar. Citric acid is the dominant acid in the ripe tomato fruit, though malic acid is also present. The researchers wanted to determine the variability of these four compounds from one variety to the next and see how that variability contributes to flavor. They grew 173 varieties on test plots in North Carolina. The varieties were selected from the approximately 6,000 accessions in the ARS Tomato Germplasm Collection in Geneva because they represent a cross section of the world’s tomato diversity. Some were commercial varieties, some were heirlooms, and others were lines used by breeders. All were part of a core collection of tomatoes kept in Geneva that had never been evaluated for fruit-quality traits. Tomatoes were classified into one of three categories: plum or roma; cherry or grape; or the traditional large, round types. Ten volunteer taste testers were trained in sensory analysis and asked to rate each variety on a scale of 1 to 5 in four sensory areas: odor, taste, flavor, and texture. Taste tests were conducted over 6 weeks. The researchers also measured each variety’s firmness and measured juice for levels of sugar, citric acid, and vitamin C.
The result is a treasure trove for breeders: a comprehensive set of rankings on flavor qualities, sweetness, vitamin C content, sugar and acid content, and other characteristics. The findings show that although thousands of compounds go into determining flavor and other characteristics, two play a key role in determining overall flavor: sugar and acid. There also was a positive correlation between sweetness and flavor. The sweeter the tomato, the more flavor it contained. The findings are good news for breeders because they show a lot of variation and a broad range of possibilities for adjusting sugar levels and developing more flavorful tomatoes. Breeding to enhance flavor shouldn't be that difficult because both sugar and acid content can be reliably and inexpensively measured, according to the researchers. * The study, published in 'Plant Genetic Resources: Characterization and Utilization' (2013), represents one of the most comprehensive efforts to identify the sources of genes for boosting flavor among both commercial tomato varieties and breeding lines.